Graduate students from across the University of California system descended on the state capitol March 21 for Graduate Research Advocacy Day. Photos courtesy UC San Diego Graduate Division. 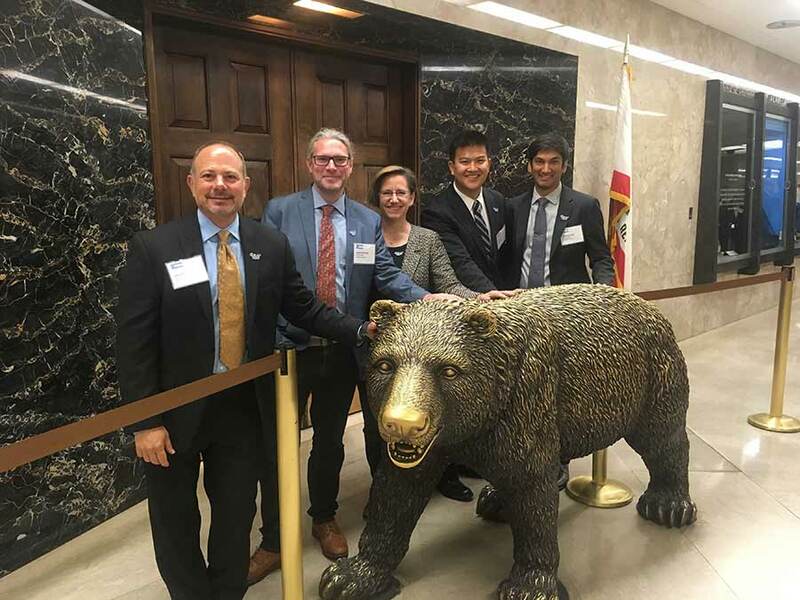 Kevan Malone, Anupam Garg and Andrew Zhao represented UC San Diego, visiting legislators with 26 additional Ph.D. and master’s students from across the University of California (UC) system. “We’re committed to working with the state on graduate student support. 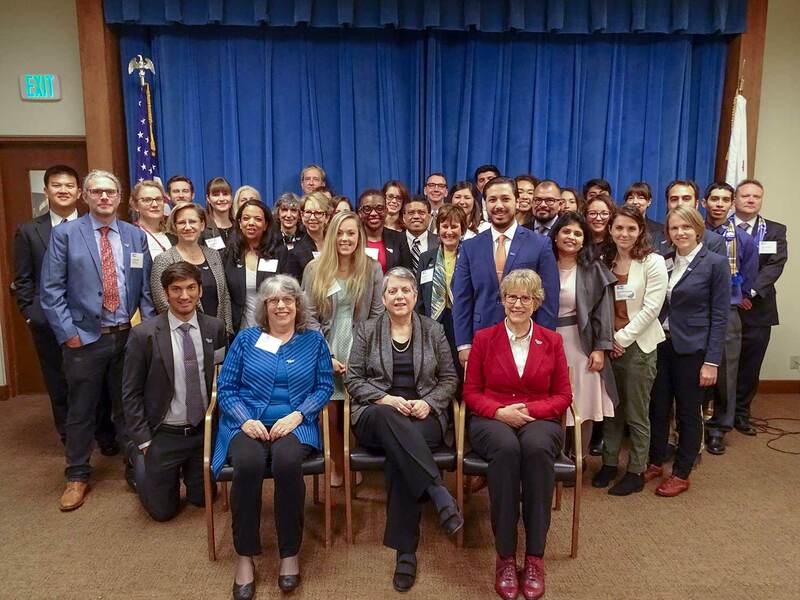 You are the university’s best ambassadors [and] your voices really do make an impact,” said University of California President Janet Napolitano to the students that morning. Graduate students serve as teachers and mentors to the university’s undergraduates, acting as a bridge between the learners and creators of new knowledge. They advance the university’s research mission by pursuing new avenues of inquiry and serving as key partners with faculty, and they go on to become the next generation of leaders in academia, industry, government and public service. From left, Assistant Chancellor Jeff Gattas, Kevan Malone, Graduate Division Dean Kit Pogliano, Andrew Zhao and Anupam Garg. “People who have never been part of a graduate program are often not aware of the vital role our master’s and Ph.D. students play within the university, or the enormous wellspring of talent they bring to the state,” said Pamela Jennings, University of California Executive Director of Graduate Studies. In all, UC graduate students create approximately 600 new inventions each year, and a startup is formed based on one of these inventions every two weeks. These new companies support 3,500 jobs, with a total of $4.1 billion in venture capital funding and bring in $520 million in annual revenue. More than 25 UC graduate students have gone on to win the Nobel Prize, and the UC system awards more than 4,000 Ph.D.s each year: that’s 7 percent of the nation’s total. In fall quarter 2017, there were 5,610 Ph.D. and master’s students enrolled at UC San Diego, including UC San Diego Health—an increase of 263 over the previous year. UC San Diego’s Ph.D. programs dominated a recent U.S. News and World Report Best Grad Schools list, with campus strengths in sciences, technology, engineering, arts and mathematics netting prestigious rankings. Chancellor Pradeep K. Khosla said the university’s cross-discipline strengths are possible in part because researchers thrive on taking risks to create real-world solutions. UC San Diego Graduate Division Dean Kit Pogliano attended with the students March 21, engaging with elected officials and discussing the impact of university research on the state of California. As official representatives for Grad Advocacy Research Day, Malone and Garg will each receive $500 from the Jane and Jiao Fan, Ph.D. ‘94 Prize for Best Advocate for Graduate Studies, awarded through the Graduate Division. The prize is given annually to each UC San Diego representative attending the UC-wide event to honor the students who are successful in marketing and communicating their research efforts. 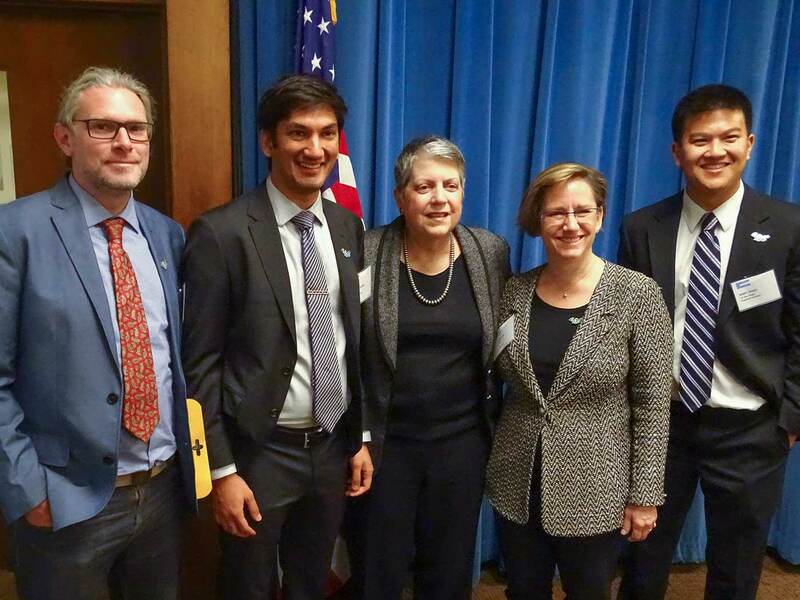 From left, Kevan Malone, Anupam Garg, University of California President Janet Napolitano, Kit Pogliano and Andrew Zhao. By analyzing the rapid growth that has occurred along the United States-Mexico border between San Diego and Tijuana, the Department of History graduate student looks to inform issues that affect both California and Mexico including housing policy, infrastructure, the environment, and migration and labor exchange. “My research examines a central paradox of the U.S.-Mexico border: that its ‘twin’ cities grew in tandem with one another, becoming more and more interconnected, during a period in which the United States erected increasingly impenetrable barriers on the international boundary between them,” Malone said. Advised by Department of History Professor Nancy Kwak, Malone’s research interests include the U.S.-Mexico borderlands, urban history, environmental history and transnational migration. “His research has direct repercussions for the state as a whole, addressing as it does the regulation of cross-border migration and labor exchange while also looking at the spatial aspects of urban growth,” Pogliano said. Using advanced imaging technology, the Department of Neurosciences graduate student records neural activity related to how the brain receives and processes color. His work aims to shed light on basic brain functions and how different types of cells contribute to visual perception. Garg is in the School of Medicine’s Medical Scientist Training Program that combines clinical training with research education in a graduate program. He will earn his M.D. and Ph.D. while gaining expertise in research, teaching and clinical care. “It was an honor to represent UC San Diego and UC San Diego Medical School for Graduate Research Advocacy Day,” Garg said, whose research interests include bioengineering and neuroscience. Garg has published five articles, including “Brain technology: Neurons recorded en masse” with Edward Callaway of the Salk Institute for Biological Studies. A Jacobs School of Engineering student, Zhao said his interest in renewable energy and the environment started when he was just a child. Today, his research focuses on preserving excess energy during the day by storing it at night, and has incredible relevance for California’s energy infrastructure. Zhao participated in a mini-Grad Slam presentation during lunch, a hint of the larger UC-wide Grad Slam competition to take place later this spring. Grad Slam is a competitive speaking event that showcases graduate student research and offers an opportunity for students to develop dynamic skills when discussing their research. Participants present their research in a three-minute “TED-like” talk that can be understood by a general audience, competing in successive rounds and receive prizes ranging from $100 to $5,000. There are 10 finalists in this year’s UC San Diego Grad Slam Contest, who will compete against each other on April 12 for the chance to represent the university at the spring UC-wide event.